The investment Samsung makes in the marketing of its two latest Android flagships, the Galaxy S III and Galaxy Note II has paid off not only in massive sales, but also in boosting the brand’s worth, shooting it among the top 10 most valuable in the world. According to Interbrand’s 13th annual Best Global Brands report, Samsung, for the first time in its history, finds its place in the Top 10 of the prestigious ranking. 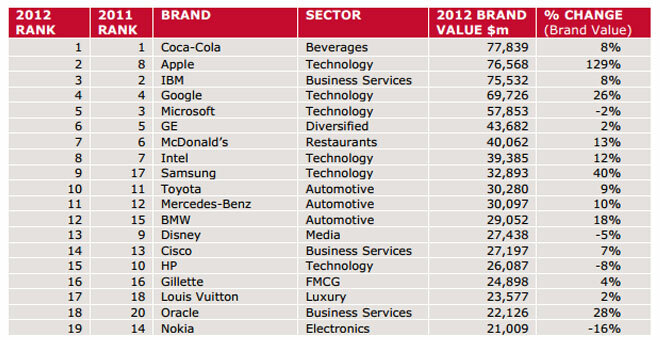 In fact, it’s now considered the 9th most valuable brand on the planet and is estimated to be worth $32.8 billion. Samsung’s value has increased by 40% since the company became the world’s largest smartphone and mobile phone manufacturer. Moreover, the aggressive marketing campaign and the buzz the Koreans have generated around the Galaxy S III and Galaxy Note II has also helped them boost their value. At the other end of the list is Apple cozily taking second place right below Coca-Cola. Valued at $76.5 billion, the Apple brand has made an incredible 129% jump in value compared to last year.